Am I turning into a health nut or what? I have eaten more kale in the past 6 months than I have in my whole lifetime, seriously. This blog is working wonders for my health and waistline (as well as my hubby’s). It was actually John that picked out this recipe, can you believe it? We received the recent issue of bon appetit on Friday. John opened it up, pointed at two recipes, looked at me and said, “honey, we’re making this for dinner on Sunday.” I then took a look at the two recipes and happily agreed. Did I mention that John is an amazing cook, even better than me? I’m such a lucky girl. Wheat berries? You’re probably wondering what the heck they are. 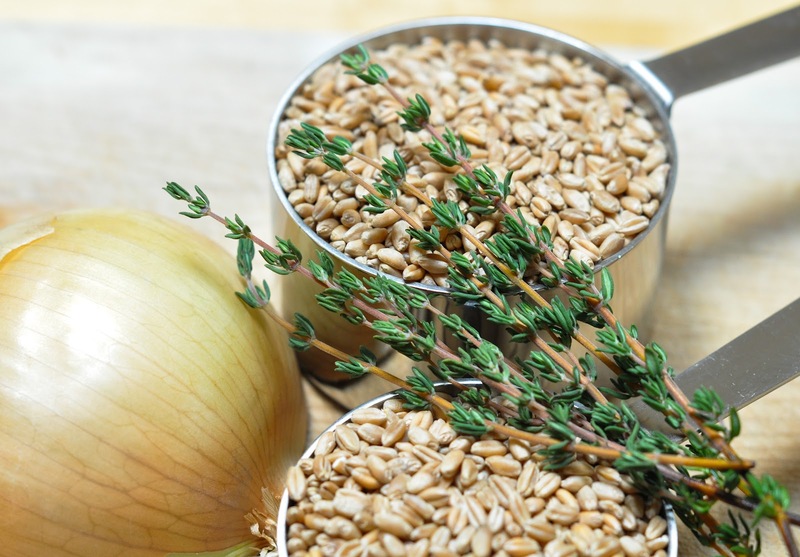 Wheat berries are simply individual kernels of wheat. They’re a true whole grain. A cup of cooked wheat berries has about 300 calories and is packed with fiber, protein and iron. 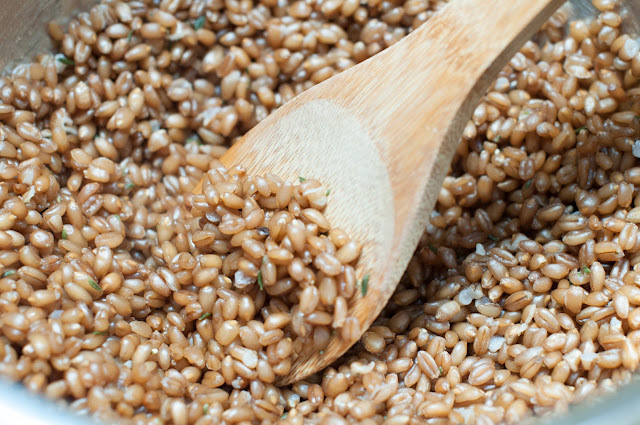 Wheat berries have a chewy bite and a subtle nutty and earthy flavor. You can find them in the natural foods section of your local grocery store. I found these at Whole Foods in the bulk bins. 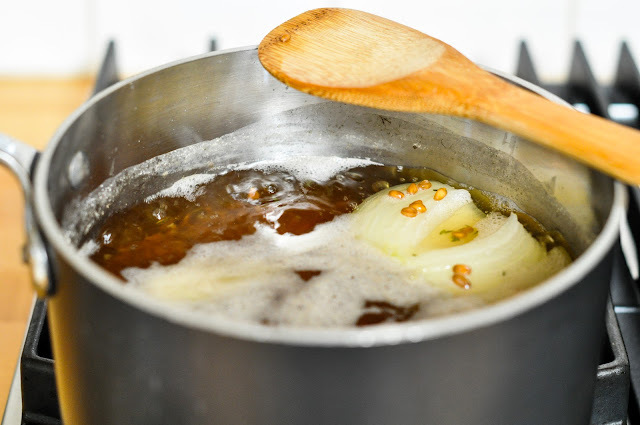 2-3 tablespoons extra virgin olive oil – The recipe called for 8 tablespoons but we did not feel we needed all the oil, so we just added what we felt was necessary. 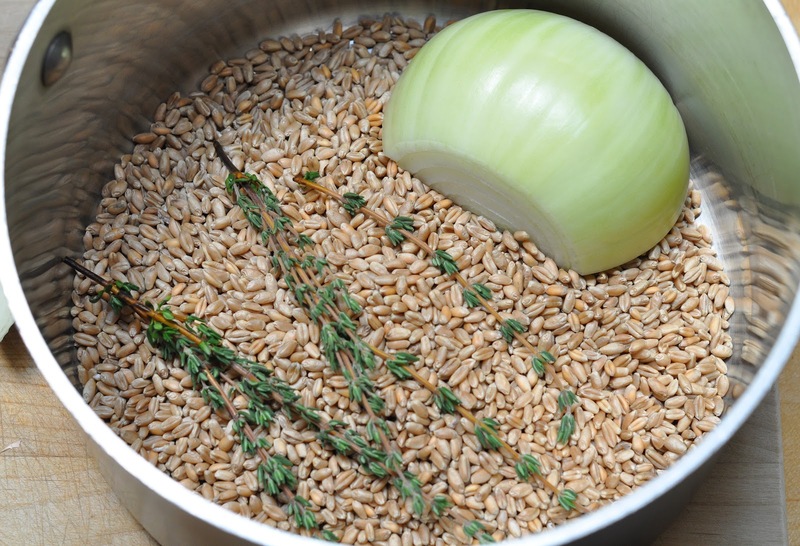 Combine wheat berries, 1 onion half, 5 thyme sprigs, and 1 tablespoon salt in a large saucepan; add water to cover by 2 inches. The below photo was taken before I put in the water, of course, but I thought it was pretty so I snapped up a picture. 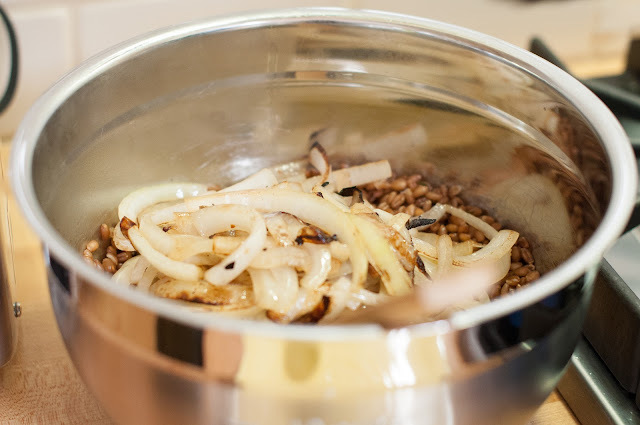 Bring to a boil; reduce heat to medium or medium low (our stove has an intense flame so we went to medium low) and simmer until wheat berries are just tender but still firm to the bite, about 35 minutes. 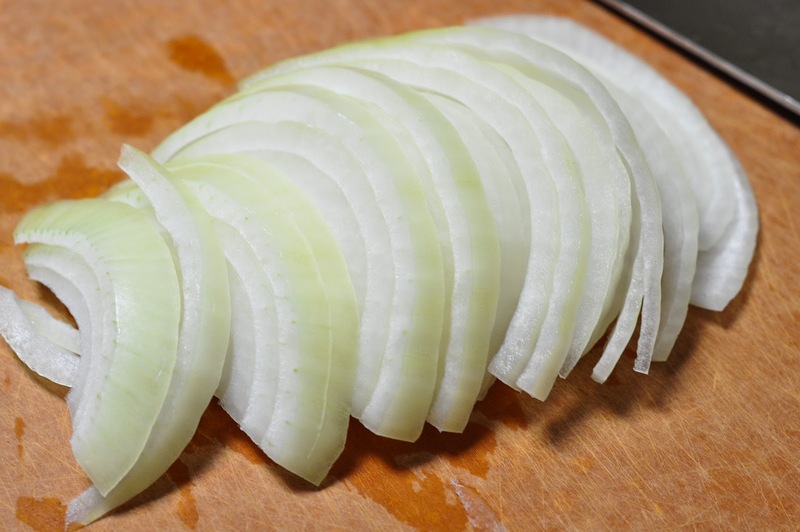 Drain in a colander and discard the onion and thyme sprigs. Place wheat berries in a large bowl and let cool. Meanwhile, rinse, de-stem, dry and tear up your kale into 2-inch pieces; set aside. Cut remaining 3 onion halves crosswise into 1/2-inch slices. 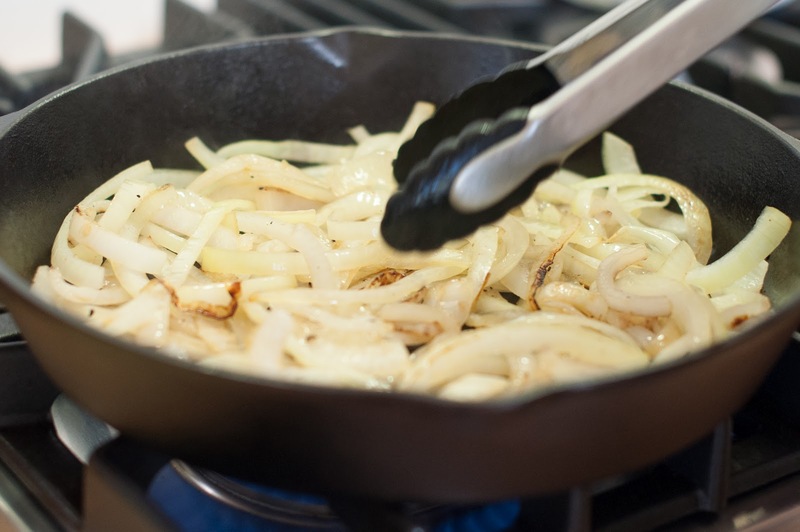 Heat 1 tablespoon olive oil in a large cast-iron or other heavy skillet over medium-high heat; add onions. Season lightly with salt and pepper. 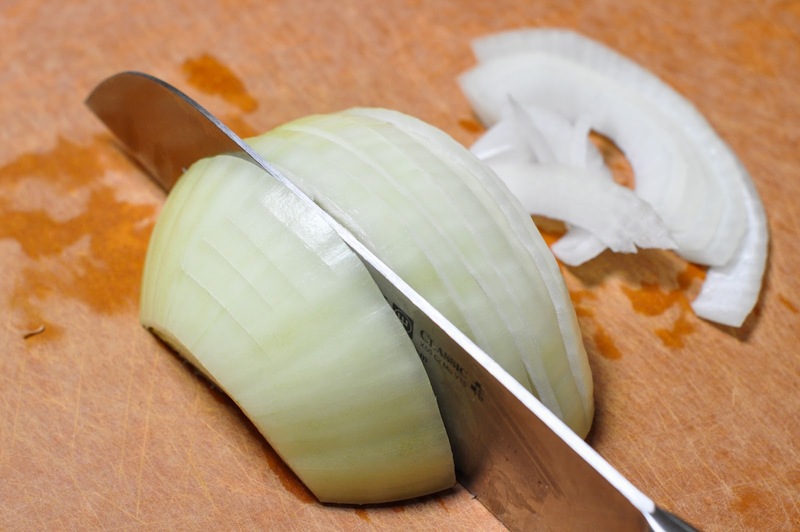 Cook, stirring occasionally, until onions are charred in spots, about 5 minutes. Add 1 tablespoon olive oil to same skillet (we actually added about 1 teaspoon as there was oil leftover). 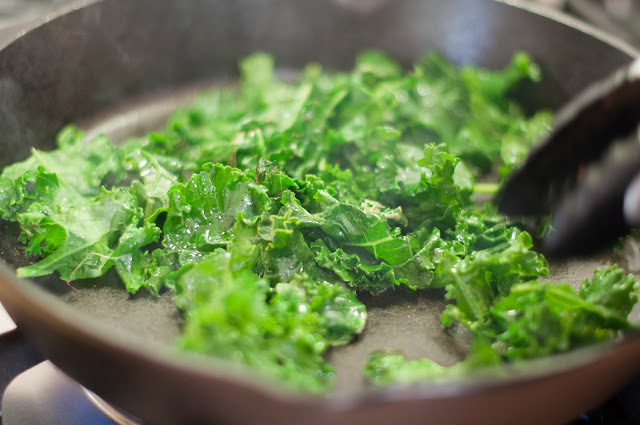 Working in 3 batches, add kale and cook, tossing occasionally, sprinkling with salt and pepper, and adding oil as needed between batches, until charred in spots, about 1 minute per batch. 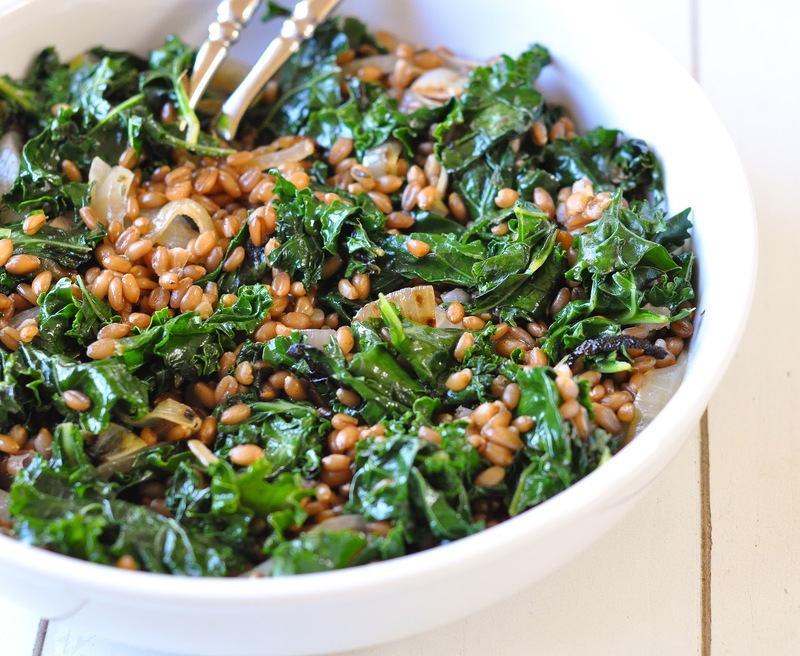 This is another tasty and kid approved way to get your kale in. My kids loved the kale sautéed this way as it reminded them of kale chips but without the crunch. Add the kale to the bowl. Drizzle with the 1 tablespoon freshly squeezed lemon juice and any remaining oil left in the pan; toss to coat. Season to taste with salt and pepper. 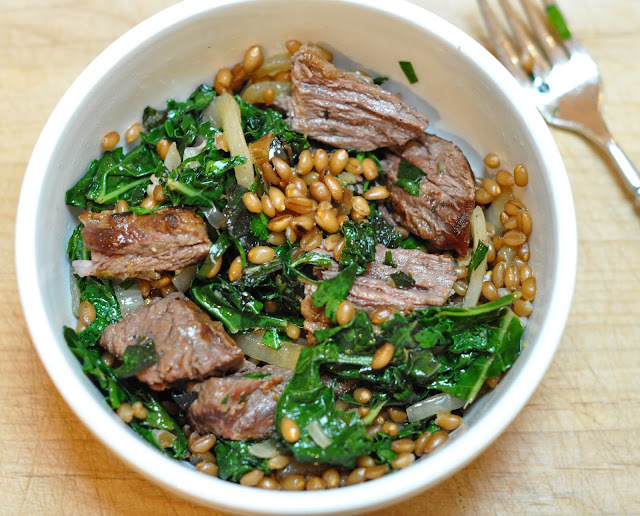 We served this up as a side salad for dinner, but I would definitely eat a bowl of this for lunch without the steak! Here were my leftovers the next day. I topped the salad with some leftover steak and the herb salsa. I then microwaved it for about 1 minute. It was a two-nighter meal and tasted just as good or even better the next night. What have you made with kale lately? Are you becoming kale obsessed like me? Hello, your recipe is great, but I must make a correction. You know how everyone says olvie oil is just fabulous? Well, it is, but only when cold. When olive oil is heated its composition changes so that it is harder to break than butter. This is due to its low boiling point. Therefore, it is better to use stable oils, such as canola or soybean. I just tried the recipe and it’s delicious! Those wheat berries are tasty. I’m going to have to add them to my repertoire . . .
Beautiful. Just gorgeous. I love wheat berries & this reminds me to make them! And I hope you’re submitting your pics to the foodie sites. You need to start! Your pics have just exploded beyond all words the past month or two..so pretty! I am also going back and updating my old posts with new photos. Zoe and I were cracking up tonight at some of my first posts because the photos are so bad and they are not edited at all 🙂 It’s fun to go back and see how much the photos have evolved. Averie, I forgot to thank you for all the photography tips and the push to purchase lightroom. It’s leagues above iPhoto. That sounds YUMMY! I love wheat berries so much.. basically I think I just love wheat and I really think eating it as wheat berries is so much healthier than bread. More filling for sure! I’m also such a sweet and savoury nut that Im thinking some dried cranberries would taste great in there as well. How were the leftovers? I sort of imagine it being the kind of dish that’s even better the next day. oh AND Im going to do a post on soaking grains soon. They are crazy about it at my college. I think it probably does have some health benefits (nothing to get too crazy about though!) and it definitely seems to make me feel less tired after I eat them, which is interesting. WOOP – okay – have an awesome Monday night! Woop back at you girl! Sounds like you are all energized from your camping expedition. I can’t wait to hear about it. I am so glad to hear that you love wheat berries as I know your not much of a carb gal. Dried cranberries would be tasty in this dish. You can really throw just about any combination in this dish and have it be a winner. 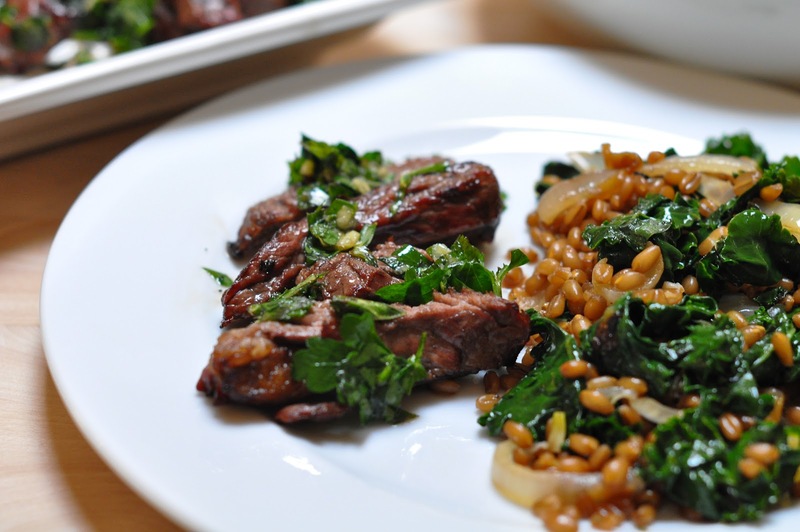 Wheat berries go with just about anything. I am going to try them for breakfast next with some berries and agave. I would love to see a post about soaking grains and even better some posts on all this amazing stuff you’re learning at college! It looks delicious! And I’ve never tried anything similar! My boyfriend (his name is John, too!) is a meat lover and I’m always trying to find new sides for steaks, etc! I’ve also read something about kale chips? Have you posted this recipe before? If you did I’d love to read it, if you haven’t you have to post it soon! Thank you Maria. My hubby and my daughter are meat lovers so I try and find healthy sides or sides that I can eat as a meal incase I am not feeling up to eating meat that night. I have made kale chips before but have not posted a recipe because I just figured there were so many recipes out there. I will post one though because I have had a few local friends ask me for a recipe as well. My kids love them and we usually make them as a healthy side to burgers instead of fries or onion rings. What a delicious and healthy dish!